Coastal Drilling began operations as an equipment supplier in the U.S. in the mid 1990s. 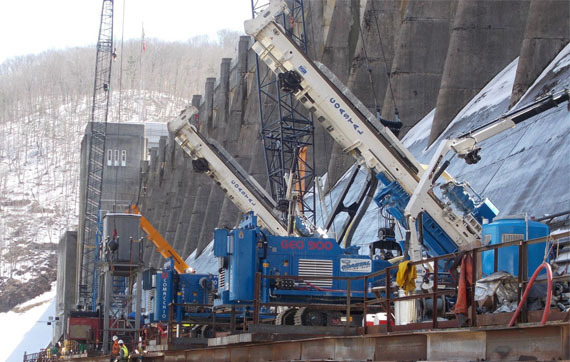 At the time, the Coastal team identified a niche building custom equipment for dam foundation and dam anchor work, and custom equipment for drill rigs and grout plants. Its products proved capable of operating under the most challenging conditions. The industry began to demand capable and skilled personnel to go along with this specialized equipment; CDE obliged. This development was the beginning of its evolution as one of the most highly regarded names in geotechnical construction. Today, Coastal Drilling East offers a wide range of geotechnical capabilities and prides itself on its ability to work closely with project stakeholders and engineers in resolving some of the toughest geotechnical challenges. Our company strives to conduct business in ways that reflect our Code of Business Ethics and Conduct. We offer several reporting channels and encourage our employees and those that work with us to ask questions, seek guidance, and report potential violations. For more information, please visit our Ethics Portal. Building the foundations of our future requires a tremendous level of discipline, attention to detail, integrity and honesty. Doing the right thing even when no one is there to see it is something CDE crews live by each day on jobsites throughout the U.S.
Coastal provides a wide range of defined geotechnical services and offers a collaborative approach to solving subsurface ground stabilization challenges. Coastal’s reputation is a reflection of its values which form the cornerstone of who and what we’ve become. We believe in doing the right thing even if no one is there to see it. We have the hardest working teams with the highest level of integrity in the business. Our reputation is rooted in strict adherence and a disciplined approach to the work Coastal’s reputation is founded in its hardworking employees and integrity of services. The Shaft Drillers International family of companies is a global solutions provider and is proud to offer the very best in technical innovation and solutions for specialized construction.